Arrow-leaf Morning Glory is a slender, perennial climbing vine, found throughout India, found as a weed in the abandoned area, plane lands, ground area and deep sandy areas, spreading over other plants. It grows up to 2 meters long. The leaves are linear, up to 10cm long and 1cm wide, tapered both ends, arranged alternately and opposite and base arrow-shaped, tooth-like base, margin three-lobed. The stem is pale brown and slender about 1 mm diameter. The flowers are Small, pale yellow, up to 6 cm long stalks, with funnel-shaped with a maroon to brown center. The fruits are capsule shaped, globose, contain 2 to 4 seeds. 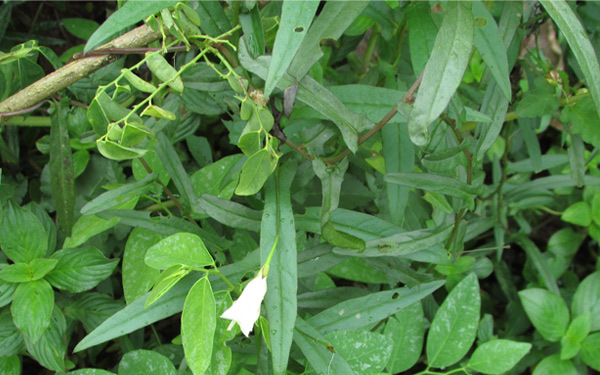 Used in the treatments of Vatha conditions such as 'Amavata', 'Avabahuka', to increase renal function and urinary related diseases. Flavanoidis-Lutedin,Diosmetion, dissmetin – 7-O-β-D- Glucoside.